Angelina Love takes on Ivelisse for @FWEWrestling on December 7th, E! 's Total Divas returns this Sunday, TNA severs ties with OVW, Su Yung vs Jessica James at @ACWrestling's Fun Fun Fun Fest, "Crazy" Mary Dobson vs Jewells Malone @DeathproofFight, Ayako Hamada & Yu Yamagata win WAVE Tag Team Championship, STARDOM: Io Shirai retains, Act Yasukawa dethrones, Ice Ribbon, REINA & WNC Results, Upcoming events, Results & More. Follow me @Ciara92189 on Twitter. ►Su Yung's first title defense as Anarchy Championship Wrestling's American Joshi Champion will come against Jessica James at "Fun Fun Fun Fest" on Friday. Yung defeated Barbi Hayden, Miss Diss Lexia and then champion Jessica James for the title via four-way at "Beyond Good & Evil" back on October 20th. Also on Friday, Miss Diss_Lexia will take on Claudia del Solis. The eighth annual "Lone Star Classic" takes place on November 17th, there will be non tournament action as Jessica James will take on Scot Summers, Darin Childs and the current Televised Champion, Angel Blue in a four-way, in which the first participant to score the pinfall will get a championship match at "Guilty By Association 8." ►Candice LeRae will face the Pro Wrestling Guerrilla Champion, Adam Cole in a non-title conest aspart of PWG's "All-Star Weekend" on December 20th. ►Niya Barela became the new World Xtreme Wrestling Blast Television Champion on Saturday, defeating Joey Janela for the title in a Lumberjack Match. ►World Wonder Ring STARDOM held it's one-hundredth show at the Korakuen Hall on Monday. First up, the Artist of STARDOM Championship changed hands as Kyoko Kimura, Alpha Female and "Amazon" Ayesha Ray known as "Monster-gun," defeated the collect unit known as "Chibizu" Yuhi, Kaori Yoneyama and Kairi Hojo. The title changed hands in Chibizu's third title defense as Kimura's Big Boot to Hojo sealed the deal. Back on June 23rd, Chibizu defeated the previous incarnation of Monster-gun (Christina Von Eerie, Hailey Hatred and Kimura) in a decision match for the then vacant titles. Chibizu continued to hang onto the titles through two successful defenses, making them the most successful Artist of STARDOM Champions and the longest reigning at 499 days in the title's history. 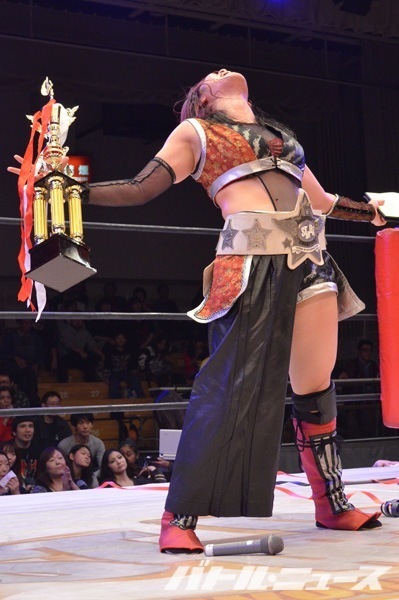 Once again, Kimura's Monster-gun has collected another string of titles in STARDOM. 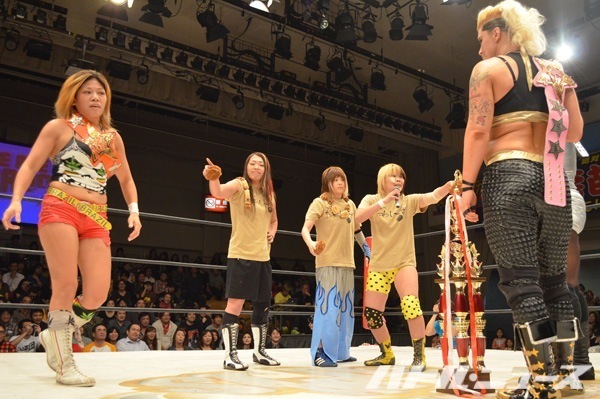 At "Ryogoku Cinderella" in March, the Goddesses of STARDOM and the World of STARDOM Championships were collected in one fell swoop by Hatred, Kimura and Alpha Female respectively. This time around, Monster-gun has the the Artist of STARDOM and the Wonder of STARDOM Championship within their clutches as the now defected Act Yasukawa dethroned "Dark Angel" Sarah Stock in her fourth defense of the title, as Yasukawa ended Stock's reign with the ACTΩ. Yasukawa was crowned the inaugural Artist of STARDOM Champions with Saki Kashima and Natsuki*Taiyo at the beginning of the year. The titles would be relinquished as Yasukawa suffered damage to her spinal cord, forcing her to be inactive for two months. Yasukawa would return in time for the 5★STAR Grand Prix. The August 17th event would see Yasukawa taking the pinfall from Kairi Hojo in the Artist of STARDOM match, she later turned on her Trouble Maker 2 stablemates(Natsuki*Taiyo and Yoshiko) and joined Kimura. Act's win is on the brink of her resurgence in the promotion, not only did she defect herself from the roster into Kimura's stable, but she was able to capture the title she had often failed to capture. Io Shirai is still World of STARDOM Champion. Shirai's anticipated third title defense against the 2013 5★STAR Grand Prix winner Nanae Takahashi headlined STARDOM's 100th show. Shirai escaped her third title defense scot-free, getting the Mágica de Io on Takahashi one second shy of the thirty-minute time limit. While Shirai was able to hang onto the "red belt" for another day, a "bigger" development took place post match as Shirai nominated Arisa Nakajima as her next challenger. However, Nakajima cited that she wanted to regain the JWP Openweight Championship from Kana at "Climax" on December 15th before accepting the challenge. If Nakajima regains the Openweight Title, she and Shirai will put both titles on the line, as one competitor will be heading both promotions as the champion. Yuuri Haruka came out of retirement last Thursday for Wrestling New Classic. Haruka, known for her stint in STARDOM, retired back in December of 2012 from active competition. Now going by "Haruka Kato," she joined Makoto's Private Puroresu Academy, aligining herself with the likes of Miyako Matsumoto, Kaho Kobayashi and recent recruit Mio Shirai. The Joshi talent pool in WNC continues to expand as Syuri will need more opponents to challenge for the WNC Women's Championship as Lin Byron and Makoto cant be the only women to contend for the championship. Speaking of Syuri, she made her first defense on the show against Yumiko Hotta, in which the WNC Women's Championship and the REINA World Women's Championship were both contested for. LLPW-X will be presenting Takako Inoue's 25th Anniversary commemoration event on November 15th at the Tokyo Dome City Hall. Tsukasa Fujimoto retained the ICEx∞ Championship for a third time on Saturday against Miyako Matsumoto. Natsuki Urabe made her debut for Pro Wrestling WAVE's "Virginity" last Wednesday, taking on Kana in losing effort to the Udegatame. That same show featured Yumi Ohka making her third successful title defense as Regina di WAVE Champion against Tomoka Nakagawa. Also, Meiko Satomura defeated Ryo Mizunami via referee stoppage. Ayako Hamada and Yu Yamagata unseated Cherry and Shu Shibutani of the Pro Wrestling WAVE Tag Team Championships on Wednesday. The 2013 Dual Shock WAVE recipients, "Las Aventureras," defeated Cherry and Shu Shibutani with Yamagata getting the Air Raid Crash on Shibutani for the pinfall. The Classic Gals become the third team this year to lose the WAVE Tag Team Titles on first offense. Las Aventureras first challengers for the titles were decided on the show as well, Misaki Ohata and Mio Shirai defeated Tsukasa Fujimoto & Hikaru Shida in a number one contender's match after Shirai got the Tsuchigumo on Shida. GAMI continued her road to retirement with a five-match series, losing to Mima Shimoda, Emi Sakura, AKINO and Hiroyo Matsumoto and her match against Mika Iida went to the time limit. Aki Shizuku and Ariya' became the new REINA World Tag Team Champions on Saturday. Shizuku and Ariya' defeated La Vaquerita and Zeuxis for the titles. The title switch comes as no surprise, as REINA Joshi Puroresu has announced that both luchadoras and Chik Tormenta would be heading back to Mexico following the event. Seleziya Sparx made her debut for the promotion, coming up short against Mima Shimoda in a three-way. Sparx will face Shimoda on Friday for DIANA. Monday's WAVE show featured GAMI losing a Hair vs Hair Match to Dump Matsumoto. Kana defeated another debutante in Rina Yamashita and Ayako Hamada took a loss to Kenny Omega. Also on Monday, DASH Chisako and Sendai Sachiko defeated Aja Kong ad Rydeen Hagane for SENDAI Girls. Meiko Satomura got the Death Valley Bomb on Carlos Amano, Eiger went over on Sakura Hirota, Sareee and Rabbit Miu went to the time limit and Kagetsu and Syuri defeated Dynamite Kansai and Manami Toyota in the main event, with Kagetsu using the Splash Mountain Cutback on Kansai, a variation of Kansai's infamous Splash Mountain. ►Brittney Savage got hitched to Jesse Neal over the weekend, Congratulations! ►Angelina Love and Ivelisse will square off at Family Wrestling Entertainment's event on December 7th in a number one contender's match for a shot at Maria Kanellis' FWE Women's Championship. Both competitors were participants in two seperate triple threat matches for "No Limits" a few weeks ago. FWE arranged the two matches to determine two number one contenders to Kanellis' title, defeating Cheerleader Melissa and Serena Deeb and Thea Trinidad and Kasey Ray respectively. The winner will go onto to face Kanellis for the title at later date. ►Jewells Malone takes on "Crazy" Mary Dobson on November 10th for DeathProof Fight Club. ►Mickie Knuckles challenges D'Arcy Dixon for the RESISTANCE Pro Women's Championship on November 23rd. ►Other Tidbits:TNA has officially severed ties with its developmetal territory, Ohio Valley Wrestling. In another attempt to salvage finances, TNA's partnership with OVW has been ended as a cost cutting measure. Over the past serveral months, rumors have circulated that talent within the developmental territory were being paid late. Irregardless of the rumors, TNA shipped notable competitors Crimson, Lei' D Tapa, Rob Terry, Taeler Hendrix, Jay Bradley, The Blossoms, Taryn Terrell amongst several Gut Check competitors to OVW to further their development. In turn, the competitors were featured on OVW's weekly television specials over majority of its unemployed roster. TNA did not reciprocate that in turn, besides Hendrix, Tapa and a handful of regular OVW competitors featured on Impact Wrestling as part of Gut Check, TNA rarely used OVW's roster to their full advantage, especially when it came to the dwindling Knockouts division. Heidi Lovelace, Jessie Belle, Solo Darling, Nikki St. John, Trina and other women that have circulated through OVW during TNA's two year relationship were slighted. As for what this does for The Blossoms and Lei'D Tapa's current reign as OVW Women's Champion, unlike back in 2008 when WWE ended its relationship with the promotion and shipped its contracted talent to Florida Championship Wrestling, TNA currently has no other developmental system in place, TNA is said to be taking its developmental facility in house as they move back to Orlando, Florida. Its likely TNA will pull all of its talent from OVW and release them from their contract to continue the cost cutting, whereas in Tapa's case she is apart of the Knockouts division. The Blossoms on the other hand were runner ups in the British Boot Camp at the start of the year and have been used sporadically at best on the television product. With the split from OVW, Lei'D Tapa retained the OVW Women's Championship on Saturday agains Lovely Lylah and Brooke Tessmacher, Velvet Sky and ODB will meet in a three-way on Impact Wrestling this week to determine the next contender to Gail Kim's title. Alot of titles were retained over the weekend. For starters, Leva Bates lost out in two title matches. On Friday, Santana Garrett retained the Southern Championship Wrestling Women’s Championship against Bates, the following day Bates came up short against Mia Yim for the Florida Underground Wrestling Women's Championship. Yim has another title match set for this weekend against Su Yung. Down in Mexico, AAA's Reina de Reinas Champion Faby Apache and Jennifer Blake will meet Taya Valkyrie and Mary Apache in a Luchas de Apuestas, with the losing team's hair on the line. Back in 2008, Faby defeated her older sister in the Luchas de Apuestas, with both competitors hair on the line. Gran Apache pleaded with Faby to not spare her sister's lock and shaved his instead. Also, Heidi Lovelace is heading to Mexico next month to work for Lucha Libra Feminil and Desastre Total Ultraviolento. Marcela retained the CMLL World Women's Championship against Dallys la Caribena for a second time on Monday in a Two Out of Three Falls Match, scoring two pinfalls on Caribena while she had one over the champion. April Davids retained the Preston City Wrestling Cruiserweight Championship against Dave Rayne in a Fans Bring the Weapons match last Thursday. Pro Wrestling Kingdom's scheduled event for November 29th, "Women of the Kingdom," looks to be reportedly scrapped. The promotion's official Facebook no longer has the show posted in their events section, as part three of the "Open the Kingdom Gate" will take place on November 30th with Kay Lee Ray taking on Eddie Dennis for the vacant PWK Championship. Ray just defeated Bubblegum last Saturday to become one of the challengers for the title. Leah Von Dutch picked up her victory in the United Kingdom on Saturday as she defeated Dragonita with the Dutch Clutch. Dutch's last tour overseas saw her come up short in all of her matches. Over in New Zealand, Scarlett defeated Nurse Payne to become the new Kiwi Pro Wrestling Women's Champion on Saturday via the Perfect Plex. Miami and Kellyanne English have been announced for WRESTLECLASH's "A Very WrestleClash Christmas" on December 6th. Both competitors will be competing in a Mixed Tag Team Match, with Miami teaming up with Mr. Juicy and English with Adam Brooks. Evie's PWWA Championship will be on the line come Friday as she defends the unified championship against Jessie McKay, Shazza McKenize and Michelle K. Hasluck in a four-way. That same event will see Madison Eagles, Chris Vice and Vinny Dunn take on Ryan Eagles, Mark Davis and Rick Sterling. Evie will also be challenging Emmy Driver for the Impact Pro Wrestling Women’s Championship on November 16th. Matches for this Saturday's Riot City Wrestling's "City Chicks UNLEASHED" are starting to be unveiled. Shadow Shinobi will be taking on Vixsin in her debut for the promotion, while Harley Wonderland takes on Storm. Miami faces Demi Bennett and Michelle K. Hasluck takes on Izzy Shaw. ►Tripp Cassidy def Heidi Lovelace at Beyond Wrestling's "Block A-C of Tournament For Tomorrow 2"(October 27, 2013). ►La Amapola def Estrellita at CMLL(October 29, 2013). ►Pro Wrestling WAVE(October 30, 2013): Misaki Ohata & Mio Shirai def Tsukasa Fujimoto & Hikaru Shida/ Kana def Natsuki Urabe/ Meiko Satomura def Ryo Mizunami/ Ayako Hamada & Yuu Yamagata def Shu Shibutani(c) & Cherry(c)/ Yumi Ohka(c) def Tomoka Nakagawa/ Moeka Haruhi & Sawako Shimono def Sakura Hirota & Fairy Nipponbashi /Mima Shimoda def GAMI / Emi Sakura def GAMI / AKINO def GAMI / Hiroyo Matsumoto def GAMI / GAMI vs Mika Iida went to time limit draw. ►Gail Kim(c) def ODB on Impact Wrestling(October 31, 2013). ►Wrestling New Classic(October 31, 2013): Haruka Yoshimura vs Lin Byron to a draw /Koharu Hinata def Kaho Kobayashi / Makoto, Miyako Matsumoto, Haruka Kato & Rey Paroma def Takuya Kito, Horizon, 10-sunin & no Kuzutachi /Syuri(c) def Yumiko Hotta. ►Naomi def Aksana on WWE's Superstars(October 31, 2013). ►Ice Ribbon(October 31, 2013): Kurumi & Kyuri def Risa Sera & Ayame Yabe /def 235 / Tsukasa Fujimoto, Hikaru Shida & Mio Shirai def Hamuko Hoshi, Neko Nitta & Meari Naito /Hamuko-fu Tsukushi def Kazuchika Sera. ►April Davids (c) defeats Dave Rayne at Preston City Wrestling's "Fright Night Part 2"(October 31, 2013). ►Natalya & The Bella Twins def AJ Lee, Alicia Fox & Tamina Snuka on Friday Night Smackdown(November 1, 2013). ►KC Cassidy def Jessie McKay at ZERO1's "Wrestle Rampage"(November 1, 2013). ►Kylie Pierce def Kimber Lee at Absolute Wrestling League(November 1, 2013). ►Mercedes Martinez defeats Su Yung at Florida Underground Wrestling's "Throwdown 8: The Silver Screen Showdown"(November 1, 2013). ►Goya Kong, La Silueta & Marcela def Dallys la Caribena, La Seductora & Tiffany at CMLL(November 1, 2013). ►Santana Garrett(c) def Leva Bates at Southern Championship Wrestling's "15th Anniversary"(November 1, 2013). ►Absolute Intense Wrestling's "Double Dare"(November 1, 2013): Devin & Mason Cutter def Veda Scott & Gregory Iron/ Allysin Kay(c) def MsChif. ►Mia Svensson def Amanda Rodriguez at Ring Wars Carolina(November 2, 2013). ►DAIJO(November 2, 2013): Sawako Shimono vs Rina Yamashita ended in a draw/ Kana def Mika Iida / Kagetsu def Aya Yuki / GAMI def Kyusei Ninja Ranmaru / Sawako Shimono, Fairy Nipponbashi, & Benten-musume def Police~woman, Misaki Goriko, & Nyamber / Benten-musume def Nyamber /Police~woman def Sawako Shimono /Sawako Shimono def Police~woman. ►Jessie Kaye & Chris Wylde def Renee Michelle & Ricky Martinez at East Coast Wrestling Association's "4-Ever II"(November 2, 2013). ►REINA Joshi Puroresu(November 2, 2013): Keiko Aono & Yuiga def Sareee & Leon/ Ariya' & Aki Shizuku def La Vaquerita & Zeuxis/ Dump Matsumoto def Chik Tormenta/ Mima Shimoda def Rabbit Miu & Seleziya Sparx/ Jenny Rose def Rydeen Hagane. ►Scarlett def Nurse Payne(c) at Kiwi Pro Wrestling's "Halloween Howl 7"(November 2, 2013). ►Kacee Carlisle def Jessie Belle Smothers at Hoosier Pro Wrestling(November 2, 2013). ►Ohio Valley Wrestling(November 2, 2013): Lei'D Tapa(c) def Lovely Lylah/ Dylan Bostic & Evan Markopoulos def Holly Blossom, Jessie Belle & Stephon J. Baxter III. ►Riot City Wrestling's "Powertrip"(November 2, 2013): Savannah Summers def Demi Bennett/ Kellyanne English def Harley Wonderland. ►Leah Von Dutch def Dragonita at Extreme American Wrestling(November 2, 2013). ►Ice Ribbon(Novemer 2, 2013): Hamuko Hoshi vs Kurumi went to a time limit draw/ Maki Narumiya def 235 / Hikaru Shida def Kyuri / Hamuko Hoshi & Tsukushi def Risa Sera & Rutsuko Yamaguchi /Tsukasa Fujimoto(c) def Miyako Matsumoto. ►Mickie Knuckles, Jacob Black & Zodiak def Kerry Awful & Nick Iggy at Pro Wrestling Freedom's "Declaration Of War"(November 2, 2013). ►Kay Lee Ray def Red Lightning at Premier British Wrestling's "Maximum Impact"(November 2, 2013). ►Niya def Joey Janela(c) at World Xtreme Wrestling's "Final Conflict"(November 2, 2013). ►Pure Wrestling Association(November 2, 2013): Jewells Malone def Kaitlin Diemond/ Jasmin def Alexia/ Beautiful Beaa def Jewells Malone, Jasmin & Kaitlin Diemond in a Gauntlet Match. ►Wrestling New Classic(November 2, 2013): Akebono, Makoto & TAJIRI def AKIRA, Syuri & Yusuke Kodama /Command Bolshoi & El Hijo del Pantera def Jiro Kuroshio & Lin Byron/ Koharu Hinata def Kaho Kobayashi. ►Greg Excellent def Cherry Bomb by countout at Combat Zone Wrestling's "Night Of Infamy 12"(November 2, 2013). ►SENDAI Girls(November 3, 2013): Carlos Amano & Hiroyo Matsumoto def Mio Shirai & Ryo Mizunami / Eiger def Kanjuro Matsuyama / Aja Kong & Rabbit Miu def DASH Chisako & Sendai Sachiko / Ayako Hamada def Meiko Satomura / Kagetsu def Hikaru Shida /Kagetsu & Hikaru Shida def Meiko Satomura & Ayako Hamada. ►Mia Yim def Teddy Stigma at Florida Underground Wrestling(November 3, 2013). ►Insane Championship Wrestling's "Annual Fear & Lothian"(November 3, 2013): Carmel Jacob def Bete Noire/ Kay Lee Ray def Mikey Whiplash. ►Mari Apache, Mini Psycho Clown & Taya Valkyrie def Fabi Apache, Jennifer Blake & Mascarita Sagrada at AAA(November 3, 2013). ►STARDOM(November 4, 2013): Io Shirai(c) def Nanae Takahashi/ Act Yasukawa def Dark Angel(c)/ Kyoko Kimura, Alpha Female & Ayesha Ray def Kaori Yoneyama(c), Yuhi(c) & Kairi Hojo(c)/ Natsuki*Taiyo & Yoshiko def Mayu Iwatani & Miho Wakizawa/ Hiroyo Matsumoto def Takumi Iroha / Natsuki*Taiyo def Koguma. ►SENDAI Girls(November 4, 2013): Sareee vs Rabbit Miu went to a time limit draw/ Eiger def Sakura Hirota /DASH Chisako & Sendai Sachiko def Aja Kong & Rydeen Hagane/ Meiko Satomura def Carlos Amano /Kagetsu & Syuri def Dynamite Kansai & Manami Toyota. ►Monday Night RAW(November 4, 2013): The Bellas & Eva Marie def AJ Lee(c), Tamina Snuka & Aksana/ Natalya & Tyson Kidd def Summer Rae & Fandango. ►Pro Wrestling WAVE(November 4, 2013): Ranmaru, Command Bolshoi & GAMI def Tomoka Nakagawa, Tsukasa Fujimoto & Hikaru Shida/ Kana def Rina Yamashita/ Danshoku Dino def Shuu Shibutani/ Yumi Ohka def Fairy Nipponbashi/ Sawako Shimono, Misaki Guriko & Police Wo~man def Moeka Haruhi, Natsuki Urabe & Ryo Mizunami/ Sawako Shimono, Misaki Guriko, Police Wo~man, Benten-Musume, Fairy Nipponbashi & Nyanber de Yu Yamagata, Mika Iida, Ryo Mizunami, Natsuki Urabe, Moeka Haruhi & Yumi Ohka/ Kenny Omega def Ayako Hamada/ Dump Matsumoto def GAMI. ►Marcela(c) def Dallys la Caribena at CMLL(November 4, 2013). ►Estrellita, Goya Kong & Marcela def Amapola, La Comandante & Tiffany via disqualification at CMLL(November 5, 2013). ►Nikki Bella def Alicia Fox on WWE's Main Event(November 6, 2013). ►Anarchy Championship Wrestling's "Fun Fun Fun Fest" on November 8th: Miss Diss_Lexia vs Claudia del Solis/ Su Yung(c) vs Jessica James. ►Alexxis Nevaeh(c) vs Mistress Belmont at New England Championship Wrestling on November 9th. ►OZ Academy on November 10th: Sonoko Kato vs Carlos Amano/ Chikayo Nagashima vs Mio Shirai / Dynamite Kansai vs GAMI/ Aja Kong, Tsubasa Kuragaki, & Hikaru Shida vs AKINO, Hiroyo Matsumoto & Kagetsu/ Mayumi Ozaki & Yumi Ohka vs Manami Toyota & Tomoka Nakagawa. ►"Crazy" Mary Dobson vs Jewells Malone at Deathproof Fight Club on November 10th. ►JWP on November 10th: Kana vs Rydeen Hagane/ KAZUKI vs Risa Sera/ Command Bolshoi vs Sachie Abe/ Hanako Nakamori & Yako Fujigasaki vs Rabbit Miu & Tsukushi/ Kayoko Haruyama & Leon vs Arisa Nakajima & Manami Katsu. ►LLPW-X's "Takako Inoue 25th Anniversary" on November 15th: SAKI vs MIZUKI/ Eiger vs Command Bolshoi/ Shinobu Kandori & Jaguar Yokota vs Dump Matsumoto & Tomoka Nakagawa/ Takako Inoue & Kyoko Inoue vs Yumiko Hotta & Manami Toyota. ►Kellie Skater(c) vs Storm at Pacific Pro Wrestling on November 16th. ►Anarchy Championship Wrestling's "Lone Star Classic" on November 17th: Jessica James vs Scot Summers vs Darin Childs vs Angel Blue. ►Mickie Knuckles vs D'Arcy Dixon(c) at RESISTANCE Pro on November 23rd. ►Madison Eagles(c) vs Saraya Knight at New Horizons Pro Wrestling's "Final Chapter" on November 29th. ►Kay Lee Ray vs Eddie Dennis at Pro Wrestling Kingdom's "Open the Kingdom Gate" on November 30th. ►Angelina Love vs Ivelisse at Family Wrestling Entertainment on December 7th. ►"Dropkick Depression" on December 14th: Kitana Vera & Terra Calaway vs Rhia O’Reilly & Mariah Moreno. ►Candice LeRae vs Adam Cole(c) at Pro Wrestling Guerrilla's "All-Star Weekend" on December 20th. ►Women Superstars Uncensored on February 8th.